Home Page | Background & Facts | Voices | youth & guides | Wildlife & Ecology | You Can Help! On August 29, 2005, Hurricane Katrina ravaged portions of America’s WETLAND east of the Mississippi River. This image shows how the storm developed from a tropical storm to a Class 5 hurricane once in the Gulf of Mexico. The storm made landfall in Louisiana as a Class 3 hurricane, but due to the storm's earlier strength and size, the Gulf Coast of Mississippi and Louisiana was inundated wtih a 30 ft. storm surge. When Katrina reached New Orleans, the hurricane had been downgraded to a Class 1 or 2. Before the storm, general opinion was that this area might lose 60 square miles of vegetated wetlands by 2050. In eight hours, Hurricane Katrina destroyed 80 square miles. After Hurricane Rita passed through America’s WETLAND on September 24, 2005, the portion of coastal wetlands between the Atchafalaya and Pearl Rivers had lost some 217 square miles of vegetated marsh to open water from the two hurricanes. Scientists at the National Wetlands Research Center and various universities in Louisiana and throughout the nation are actively assessing the present condition of America’s WETLAND and the potential for its recovery. 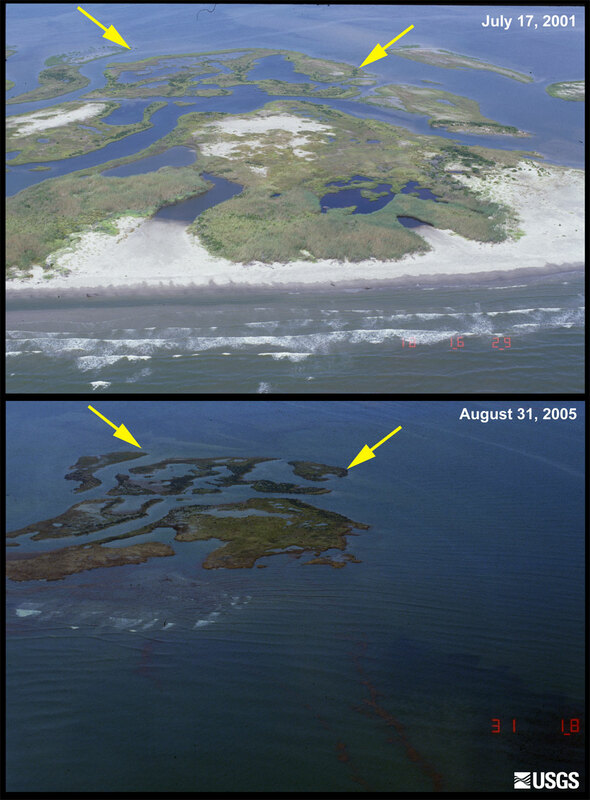 The Chandeleur Islands, the arc of barrier islands across the interface between the Gulf of Mexico and Breton Sound, were hit very hard by Katrina. A decade ago, some of them had elevations up to 2 or 3 meters above sea level. After Katrina, the highest point in the chain was 0.7 m.
These photos show the extent of loss during Katrina. In better times, the Chandeleurs and their surrounding waters were home to a host of organisms, especially season nesting birds like these Royal Terns on Curlew Island in June 1988. Unfortunately, there are no data yet on the loss of vegetated wetlands in the Chenier Plain (America's WETLAND west of the Atchafalaya Basin). The City of New Orleans was decimated by flooding caused by a combination of several levee failures and overtopping of other levees by the tidal surge. Over 80% of the city was flooded. The Times Picayune developed this graphic which provides a detailed timeline of the flooding of New Orleans. The enormity of the flooding spread across New Orleans is easily visualized by the following map that shows that the extent of flooding is equal to seven Manhattens. To help others understand the scope of devastation in New Orleans, The Center for Environmental Communications at Loyola University developed this guide. The LSU Hurricane Center, http://www.hurricane.lsu.edu. The following links are jammed with photos and other content relative to Hurricanes Katrina and Rita.